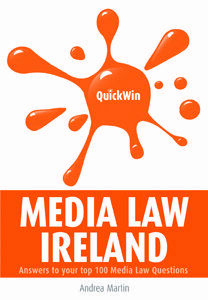 QUICK WIN MEDIA LAW IRELAND is aimed at those who work in the media industry seeking quick and practical answers to legal questions they encounter day-to-day. Written for non-lawyers, it will be useful to public relations, advertising, publishing and digital media professionals faced with legal queries arising in their work, as it will be to non-specialist lawyers and their clients when faced with a media-related problem. And students on media-related courses will find a plain English explanation of the legal principles they will learn about in media law modules. Wonder how Irish law treats copyright, defamation and privacy? This app is a shrink-wrapped version of a new book on Irish media law, written by Andrea Martin. It organises issues by section or topic and deals with almost all areas of media law, including issues affecting online media. Good value for the price, especially as the print edition costs €15. QUICK WIN MEDIA LAW IRELAND is “aimed by those who work in the industry seeking quick and practical answers to legal questions they encounter day-to-day”. Priced at €14.95 (less than a tenth of the cost of many legal textbooks), it would also be a useful addition to the library of non-specialist lawyers. Unsurprisingly, the Defamation Act 2009 (in force since 1 January 2010) features heavily. There are concise sections on, among other things, limitation periods and correction and declaratory orders and on procedural points such as information for juries on damages, lodgements and verifying affidavits. The regulation of broadcasters and of the press is set out in impressive detail. Some of the areas covered are less obvious and are all the more welcome for that. Thus, the book touches upon vicarious liability for an employee’s defamatory statements and gives helpful advice on the question of what a business can do to protect its website and social networking site from defamation claims. As someone who deals with journalists daily, I was both amused and impressed by the author’s debunking of the myth that using the word ‘alleged’ can avoid legal liability. As many defamation cases are decided by juries and are, thus, unreported, the inclusion of the details of several unreported cases alone makes the modest outlay on this book well worthwhile. I would recommend it for lawyers and non-lawyers alike. Can an email be defamatory? What about stories copied from another news source or publication? What legislation provides for the protection of privacy under Irish law? What remedies are available if someone breaches your copyright? Readers with responsibility for the marketing and communications brief will find the answers to these, and many other questions in QUICK WIN MEDIA LAW IRELAND published recently by Oak Tree Press. Solicitor Andrea Martin, a consultant to the media group at Eugene F Collins who worked for a number of years with RTE, is the author. She adopts a question and answer approach that explores a wide variety of questions ranging from defamation law through media regulation, privacy and data protection and copyright. Aimed at anyone working in the media industry, this is a useful title and is available in both print and Kindle editions.